The Washington Metropolitan Area Transit Authority has implemented a cool new rail map using the Google Maps API. 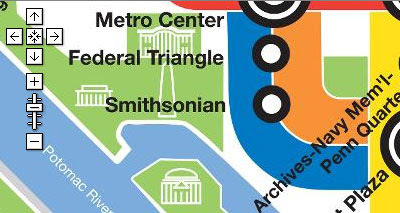 WMATA have decided to import their own rail map into the Google Maps interface using CASA'a Image Cutter utility. The Google Map Image Cutter is an application designed to take any image or digital photo and cut it into tiles which can then be displayed on a Google Map instead of the normal map tiles. The result for WMATA is that their normally static rail map is now interactive. This means users can zoom in on locations and can even switch between the rail map and the normal Google Map of Washington.